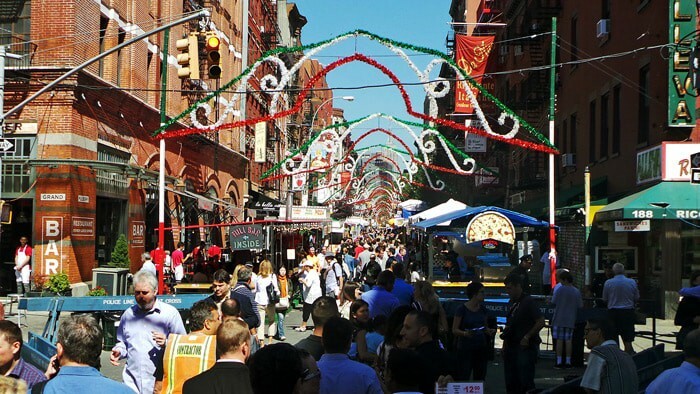 One week a year (well really 10 days but who’s counting), Mulberry street transforms into a perpetual street fair to celebrate Italian culture and cuisine at The Feast of San Gennaro. I usually stumble my way over there to check out the madness and this year is no different. With a number of coworkers in tow, I head over on a leisurely Thursday, lunchtime stroll. The fair runs the entire seven block span from Canal Street to Houston Street up Mulberry. The usually vehicle-friendly street is turned into a pedestrian-only walkway with most of the restaurants installing al fresco dining areas in the street in front of their shops. 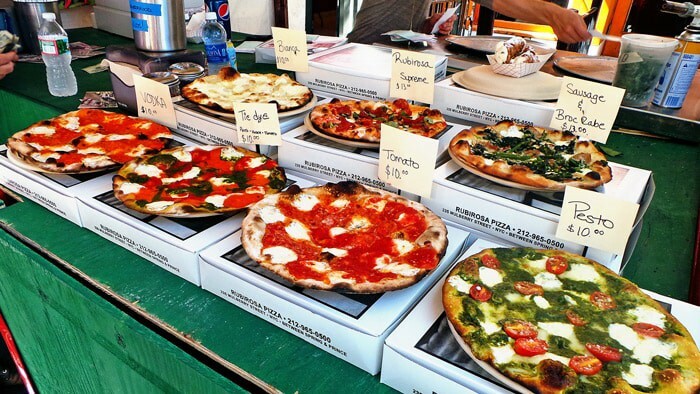 While there are many reasons to come to the San Gennaro Festival, food is the most obvious one to me. If you like carnival games, Sopranos t-shirts, or stereotypical Italian tsotchkes, they’ve got you covered too. 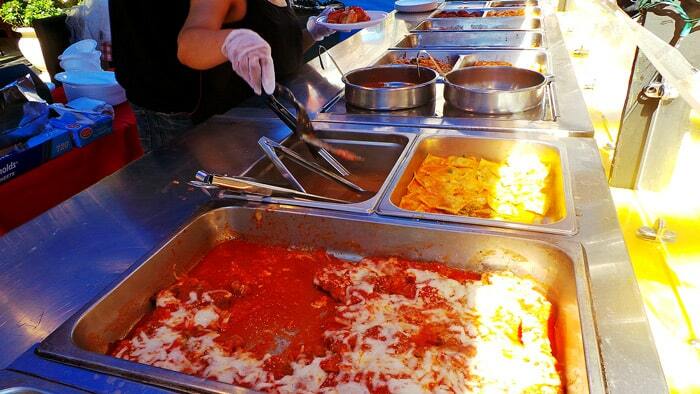 The range of food offered covers pretty much anything you could think of regarding Italian cuisine as well as some other miscellaneous standard carnival foods like gyros, arepas, and empanadas. 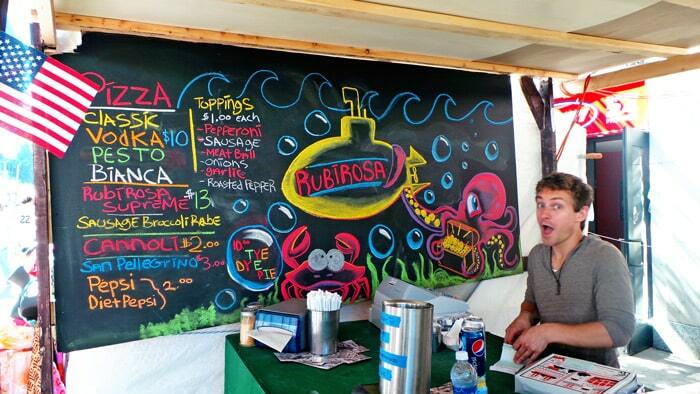 Given the variety of food offered, we took the opportunity to sample a bunch of the options. 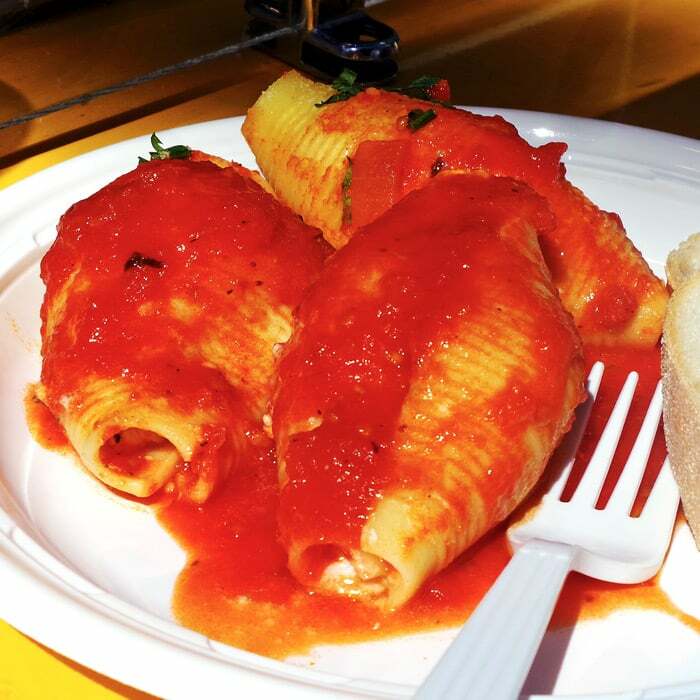 So, what does going to Little Italy for the San Gennaro festival mean to you? 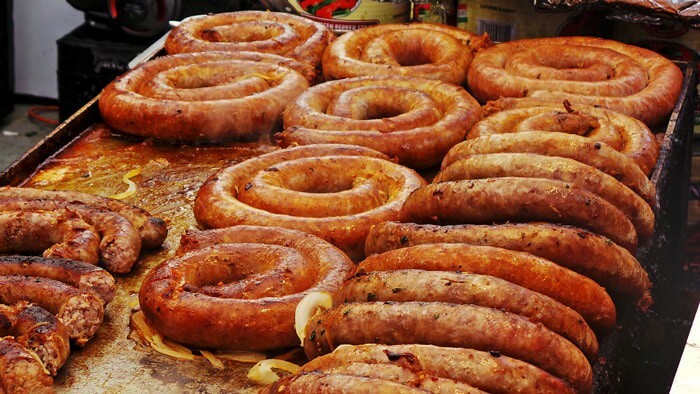 Maybe it’s about the enormous spiraled links of sweet and hot sausage? 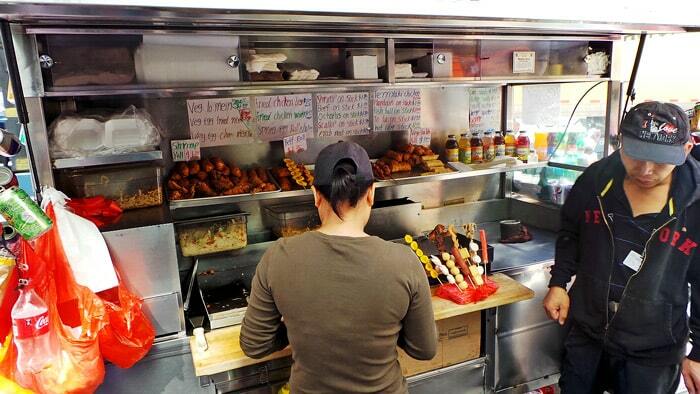 For our first dish, we stopped at the “Big Vin’s” stall as recommended by my Italian-American coworker. We order a hot sausage with peppers and onions hero. 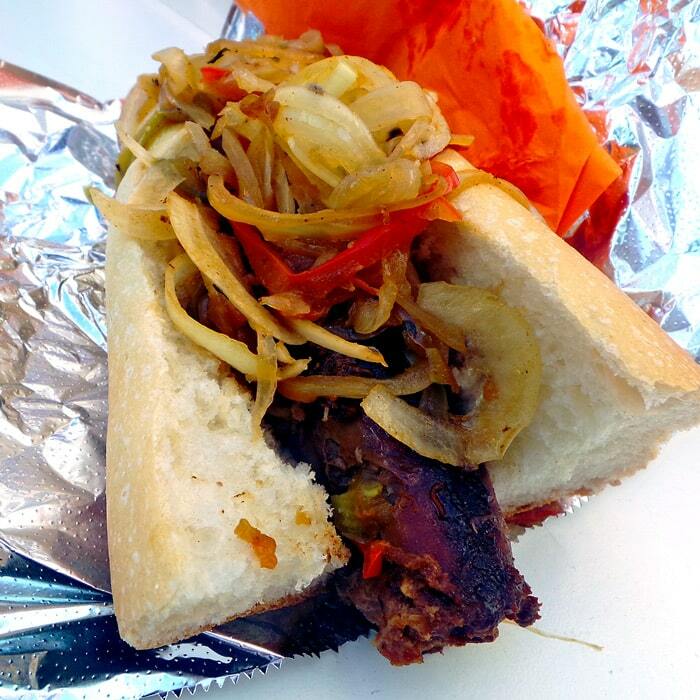 I’m not so sure we got the hot sausage as I found the spice level pretty mild, but found the sandwich as a whole to be quite hearty and satisfying with its heaping pile of sautéed peppers and onions over the thick, meaty sausage link and crusty bread. Or maybe the festival is about the pasta platters? On our second stop, we ordered the Stuffed Shells at the “Il Piccolo Bufalo” stall which again came recommended by my coworker. These shells are enormous and loaded with creamy, herb-spiked ricotta cheese and topped with a sweet tomato sauce. These shells are exactly what you would expect and hope for. Just that and nothing more. Maybe the feast is about pizza for you? On our downward sweep back through the festival on our way back to the office, we stop at the Rubirosa stall where an enormous pizza oven is situated. We order two pizzas, starting with the Tomato Pie. The pizza comes out of the oven piping hot, almost too hot to touch, but has an excellent texture on the underside and is just firm enough to stay together. The flavors are simple, but executed very well. 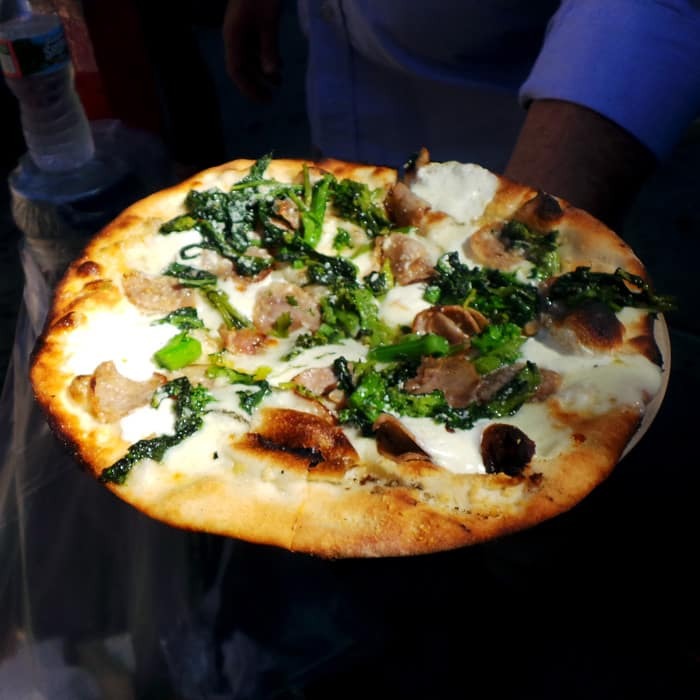 In addition to the Tomato Pie, we have Rubirosa’s Sausage & Broccoli Rabe Pie. The broccoli rabe is salty and firm and is an excellent partner to the juicy, meaty sausage slices and melty cheese. The dough has the same excellent texture as the Tomato Pie and does a great job holding the hefty toppings together on top of the slice. In my opinion, this pizza is even better than the simple Tomato Pie. 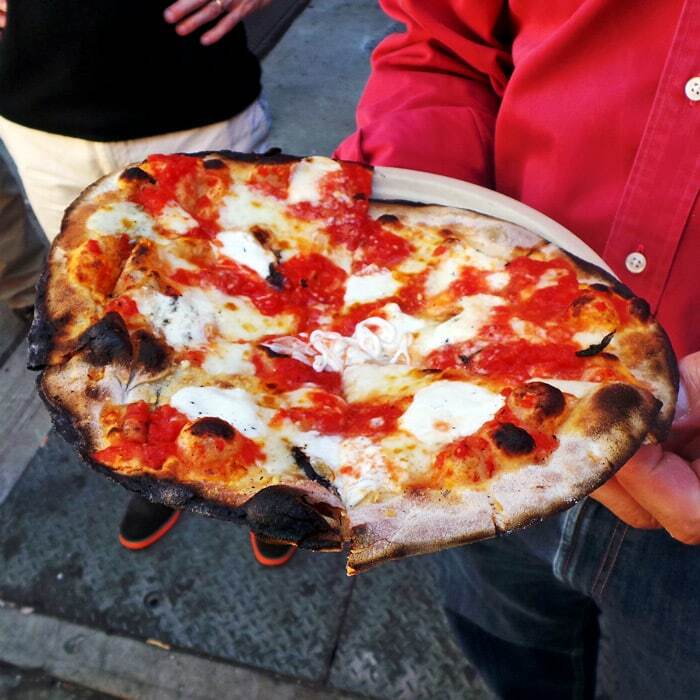 Maybe your trip to Little Italy for The Feast of San Gennaro is not about Italian food at all. Maybe it is in fact about…. Chinese food! Chinatown and Chinese cuisine has overrun the streets of Little Italy, so why not leak into this trip too. After reaching the bottom edge of the fair at Mulberry and Canal, I felt the need to have one more thing. I just couldn’t resist one more stop, even if it would be blasphemous to the rest of the Italian themed outing. I spot a lone, shiny metal cart less than a block away and let my gut guide me. I knew I wanted something fried and this seems to be the perfect place to achieve that goal. Take a gastrointestinal gamble? Sure, why not. 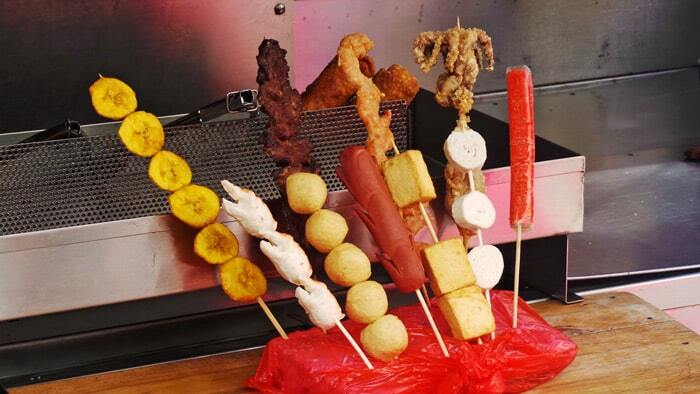 For just about the riskiest eating decision I’ve made in a long time… octopus… from a food cart… in Chinatown. I lucked out. It’s actually really delicious and cheap. There’s not that much octopus beneath the thick fried exterior, but just enough to add some seafood flavor and texture. 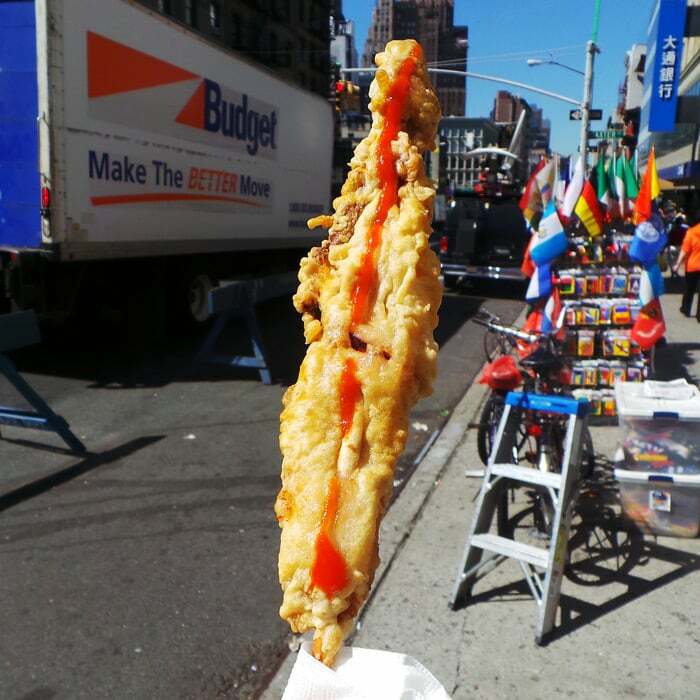 The thin line of sriracha helps adds some flavor to otherwise simply deep-fried item. If you can bare the crowds at the festival and don’t mind being surrounded by lots of tourists, there’s certainly some delicious food to be had, even if that food isn’t necessarily Italian. You captured the day perfectly.